So, you’re on a plane—wait, you’re not on a plane? Okay, bear with me. You’re on a hypothetical plane, and you’ve brought along your iPhone or iPod touch to watch some video. But you don’t want to hold it for the entire multi-hour duration of your flight. And putting it down on the tray table and craning your neck just isn’t acceptable either. So what do you do? Well, clearly you go all MacGyver on the situation, like the clever person who had the idea of using an air-sickness bag as an impromptu stand for your viewing needs. Just rip out part of the bag’s bottom and slip your device in. 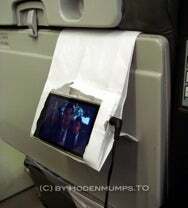 Then you can wedge the top of the bag behind the tray table—in its fully upright and locked position, of course—and even adjust the viewing angle by using the bottom flap of the bag. Genius, and it costs you nothing. Unless of course, you get airsick.